A pint of Guinness Draught as served at the Guinness Storehouse Museum in Dublin. 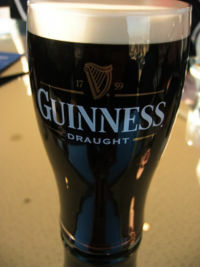 Guinness is a type of stout, originally brewed in Dublin, Ireland. Guinness has become synonymous with Irish nationality and sympathies. It is one of Ireland's most famous exports, comparable with Swiss watches or French cheese. It was founded by Arthur Guinness (b. 1725, County Kildare, d. 1803). In 1752 he inherited £100 from the Archbishop Price. Three years later he setup a brewery in Leixlip, County Kildare. In 1759, he left his brother in charge of the Leixlip brewery and acquired a 9000-year lease for an old brewery in Dublin. This lease included water rights, for a rent of £45 per year. In the 1770s London Porter became popular, and Arthur started producing this in his own brewery. In 1799 he stopped production of his other traditional ales to concentrate solely on porter. The London Porter turned into Dublin Stout. For many years the brand's well-known slogan was, "Guinness is good for you." This page was last modified 18:42, 21 December 2009.